It may sound impossible that our colon can contain few pounds of stuck waste, but in reality, it is a large organ which gathers all the waste from the body organs. 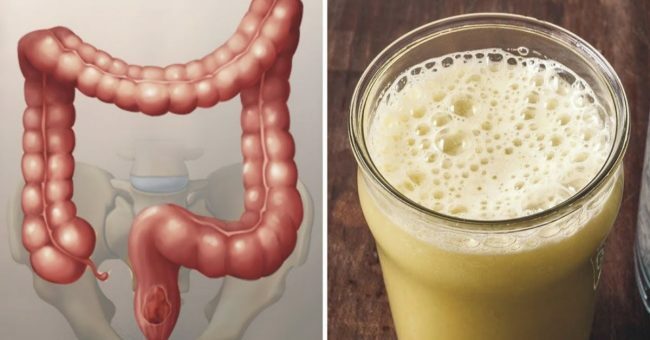 It is recommended that we all perform a colon cleanse once annually in order to eliminate the accumulated waste and toxins and improve its function. Toxic buildup weakens the body and leads to chronic diseases. Nowadays, we are constantly exposed to dangerous chemicals and contaminants, so we are even more prone to such health issues. Mix the ingredients, and drink the mixture 4 times daily, on an empty stomach, for two weeks. Days 1 and 2: Avoid processed foods, alcohol, caffeine, meat, dairy, and added sugars, and consume eating raw whole foods, especially fruits and vegetables. Day 3: Enjoy smoothies, pureed soups, and broths, and consume fresh fruit and vegetable juices. Day 4: Drink only water and fresh-squeezed orange juice. Before bedtime, drink laxative tea. Day 5: Start the Master Cleanse. During the cleanse, remember that you can only consume this cleansing drink, but you should not necessarily starve yourself. Yet, in this case, your diet should be low in carbs. You might lose weight during the colon cleanse, but you will gain it right away after is ends, since it will actually be just water weight. Glycogen and water are stored in the muscles, and when on a slow-carb diet, the body starts to use the glycogen, along with the water weight that goes with it. It is also not recommended to exercise during these two weeks, as your caloric intake is low, and you might suffer from dizziness and fatigue.